Not sure where I found this endearing folk disc. It's been in my stash for a long time, so I assumed I did some research on it awhile back, or made a note that it had SoCo regional roots (it was stamped with a Pueblo address on the label), but I since lost those notes. So thanks again to the Internet Gods I tracked down Eric, who lives in Crestone, near the Great Sand Dunes National Park, about an hour north of Alamosa. Come to find out, the record is actually out of Arizona, but since he is still an active performer in the SoCo region, I thought I would give his record a shout-out. I'll let him share the details. "I wrote those two songs my senior year of high school, this would have been 1967. 'A Red Flower' is something I wrote after reading the book, The Little Prince, in high school." 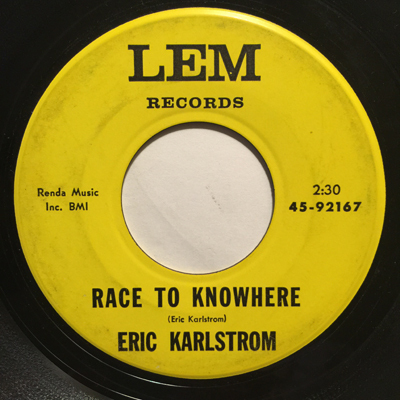 Listen to a sample of "Race to Knowhwere"
'The Race to Knowhere' kind of grew out of my readings on existentialism in high school - also perhaps the general mood of the country back then - this would have been 1967 - and the fact that both my parents were pretty high-powered academics. At the time, I kind of dreaded jumping into the rat race, but did anyway, of course. I got a M.A. and Ph.D., and became a university geography professor, but kept doing music throughout, of course. LEM (the name of the label) stands for Lunar Excursion Module, the vehicle that the astronauts were going to use on the moon landing. My father was one of the geologists who trained the astronauts for the moon expeditions back in the late 1960s and early 1970s. He funded the 300 copies that were pressed. Calling it LEM Records was his idea. One of my high school friends' father suggested that I record the song at the local KAFF radio, in Flagstaff. I played harmony guitar and sang, and another high school friend, Richard Cavanaugh played lead guitar, and Dennis Olesniwich played tambourine. Before we pressed the tape into vinyl the guy at the record company suggested it needed a bass. So my father paid a local bass player $20 to dub the bass part. 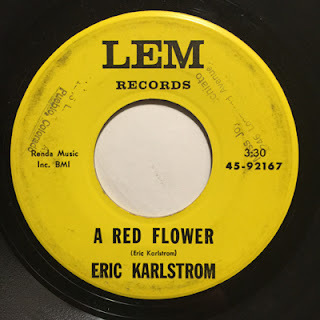 A high school buddy, Dave Fronske, was so taken by the sentiment of 'The Red Flower,' that he personally distributed it to all of the juke boxes in the local restaurants in Flagstaff. The radio DJs in Flagstaff also played it a lot - so I had my 15 minutes of fame pretty early in my career."